My wife and I were taken to dinner the other day by a very nice couple who appreciate fine dining – they took us to Cracker Barrel. 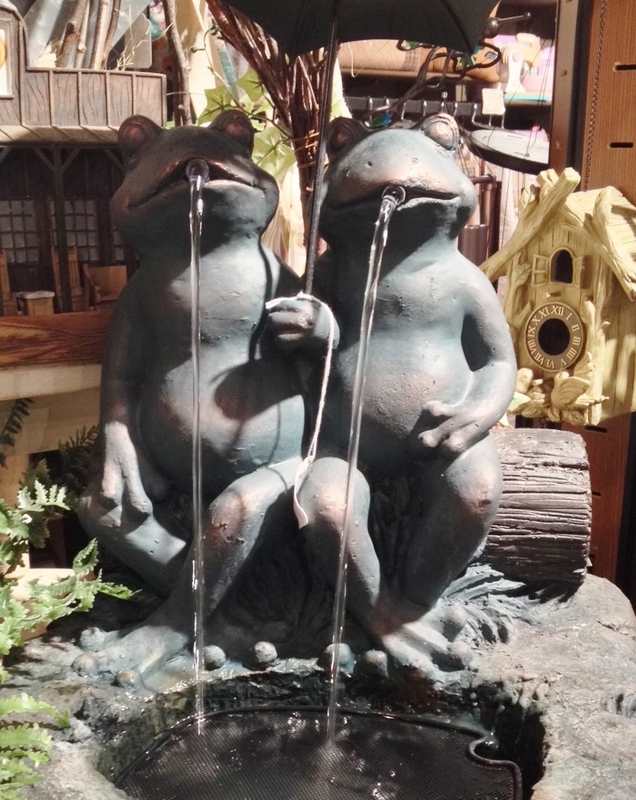 While in the gift shop, I noticed two frogs continually spitting into a small pond. First, what is so attractive about a fountain with spitting frogs? I mean, do frogs spit? And if they do, wouldn’t that much be a sign of impending kidney failure and death? What would make an amphibian with projectile saliva be your first choice of lawn decoration? Secondly, notice the water. The saliva stream spewing from the frog on the right is obviously falling at an angle due to the position in which he/she is sitting. What might not be as noticeable is that the one on the left, as I was standing there watching, was really, literally falling to the left, i.e. NOT straight down! HOW IS THAT POSSIBLE? So, another couple walks up behind me and I say to the husband, “Does the water coming out of the frog’s mouth on the left look like it’s falling straight down?” “Huh, no it doesn’t,” he said. Thinking about the frogs and the crazy water, I was reminded that our eyes can play tricks on us. In reality, based on what we see, our understanding of the world can be very misleading. That is why, even in the darkest nights of life, I trust God: He knows what’s really going on. About a week and a half ago I hurt my foot – my Achilles tendon, to be precise. I was mowing grass with a push mower on this deity-forsaken hill (the front part of the same yard where I fell three years ago and tore my right rotator cuff) when I strained the tendon where it inserts into the right part of my right heel. The pain woke me up from my sleep. And this is what the front yard looked like until someone else came and mowed it for me. 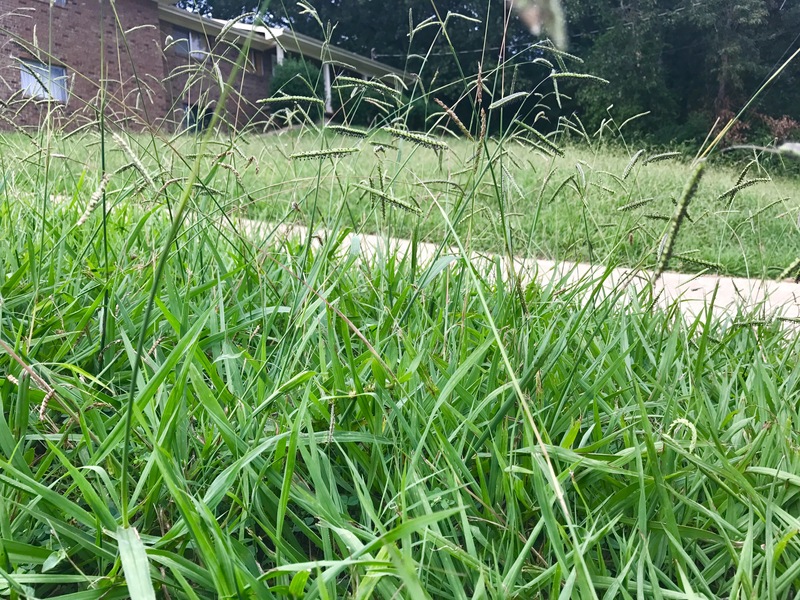 Did you know the grass in Tennessee could grow to 30 feet? Because I could barely walk, even with crutches, I had to go to the orthopedic doc to find out how bad I was hurt. Long story short, I ended up going to physical therapy to strengthen my ankle and receive treatment for the tendon. As of today, praise God, everything is going well and I’m back on my feet with little or no pain. But I’m NEVER mowing that yard again! I’ll make my daughters do it! Well, as I was sitting with an ice pack on my foot, there was a woman across the room throwing a weighted ball onto a slanted trampoline. The object of this exercise was to strengthen her ankle and increase her balance. Earlier, not long after I got to physical therapy, I, too, was doing something to strengthen my ankle and help with my balance. So, as I was waiting for the timer to go off so they could remove the ice pack, I had time to ponder something. The physical therapist was not too familiar with what I was talking about, so I explained. Amateur artist’s rendering of actual martial artist named Anthony. “That’s interesting,” the therapist replied. And here’s the thing. In my therapy I had to stand on a soft cushion, putting all my weight on the heel of my right foot. As long as I focused on an object in front of me, I could stand there with no support on that one foot and never fall. As soon as I looked around or looked down at my foot, I would lose my balance. And when I eat at Chinese restaurants I catch all the stray flies with my chopsticks. If you are already a believer, and if you’re familiar with Peter and his stroll across the water, then you’ve probably already figured out most of what I’m about to say: When we keep our eyes on Jesus, we are less likely to fall. However, I never thought about Peter when my foot was being iced; I just thought about Jesus. You see, I don’t get to ride in too many boats, and I’m not likely to get out of one once I’m in it. On the other hand, this old flesh gets distracted and falls every chance it gets, even when the ground is solid and flat. Instead of glancing around at what’s going on in the world; instead of looking down and wincing at what causes me pain; instead of looking at the clock and wondering when it’s all going to end; maybe I should keep my eyes focused on my Heavenly Sensei (Jesus), bring this body under control, keep it in balance, and train it for the fight. After all, I’d like to land a few more good ones on the Devil, wouldn’t you? But it was to0 long a night. I slept till I saw the light. I don’t have to write! There’s nowhere a paycheck to write. And just mow all my stresses away. What in the world does a preacher think about on Thursdays? Let’s find out! Secondly, notice the water. The little stream from froggy on the right is obviously falling at an angle due to the position in which he/she is sitting. What might not be as noticeable is that the one on the left, as I was standing there watching, was really, literally falling to the left, i.e. NOT straight down! HOW IS THAT POSSIBLE?